Recently I was listening to a discussion by some other moms about how they spend a good deal of money to buy organic and natural products for their families. At first I started to feel bad, because quite honestly we can't afford a lot of organic products at this time in our lives. However, I as I thought more about the conversation, I realized that there are lots of strategies that I am able to use make sure that my family is eating a healthy and wholesome diet, even on a tight budget, and that there are even additional strategies that I could work on incorporating into our lives. - Cooking and baking from scratch - This is one of the main ways that I create a healthy diet for our family. I normally bake all of our bread, as well as other baked goods such as muffins, bagels, and cookies. This ensures that I can control what goes into them and eliminates all the extra sugar, preservatives, and additives found in commercial baked goods. I also always cook dinner from scratch, and I rarely use bottled or packaged sauces or seasonings, eliminating a ton of sodium. - Focusing on less expensive healthy foods - To read some magazines, you would think that you have to rely on edamame and avocados to be healthy! However, inexpensive apples and bananas are also packed with nutrients. Frozen or even canned fruits and vegetables can also be a good option. I have read that frozen vegetables can have even more nutrients than fresh, since they were frozen at their peak, instead of sitting on a produce truck for a week. - Buying produce in season - We always eat with the seasons: asparagus in the spring, melons in the summer, oranges in the winter. Except for simple staples like apples or potatoes, I rarely buy fruits and vegetables that are not in season. This is a no-brainer for me, since seasonal produce is usually fresher, tastier, more local, and much less expensive! - Growing your own organic produce - This is something that we're working on as a family. Organic produce may be expensive to buy, but growing your own should ultimately cost less even than buying conventionally grown produce. Plus, it's so much fresher and tastes way better! - Using coupons for healthy and/or organic products - There are plenty of coupons out there for healthy products, and even a good number of coupons for organic products. Some of the healthy products that I have gotten on great coupon deals or even free include yogurt, steam-in-the-bag frozen vegetables, Eggland's Best eggs, organic cereal, and Muir Glen and Kashi products. For coupons for organic products, try http://www.mambosprouts.com/ and http://www.organicvalley.com/. If you watch for sales and match them with coupons, you could probably at least reduce the cost of some organics to the same as the regular price of conventional products. - Decide what your priorities are - Many of us might ideally like to eat an entirely organic diet, but if that is not practical, decide on an alternative. Maybe you buy all organic produce or meat but stick with conventional products for other items. Or maybe, like me, you don't buy a lot of organic products, but you try to focus on eating homemade items and whole foods. As with many aspects of the frugal lifestyle, it's important to know what your goal is and then figure out ways to make it happen. 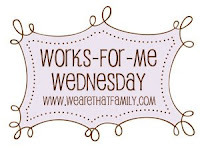 Check out Works for Me Wednesday at We Are That Family. I like you thoughts, and agree most with knowing your priorities. I think it all comes back to that one. If it's a priority, we always seem to make it work. Great tips. I admit, I'm probably like one of those Moms that you were listening to, but I try really hard to stretch my dollars. It's hard sometimes though! I have found that emailing the companies of the products I buy, and asking for coupons, has been pretty successful. Some will send $1 off coupons or even coupons for free products! Thanks for this post! Health should not be tied to income level, or ability to purchase organic. To me, organic produce is great, but as for other organic products (like cereal or cookies, for Pete's sake) I think there's a bit of a marketing ploy going on. Great post, and wonderful ideas. I was also told that if you buy veggies and fruit in the non organic section to strip them down from the peel and you have the cheap version of "organic." Not sure if that made sense. It is true! I have done it during lean times and still get the benefits. of course I know there is more to organic than just that but it is a healthy start if you are worried at pesticides. I think this is a really great list. Being thrifty doesn't mean living on white bread and kool-aid and being healthy doesn't mean purchasing all of your groceries at Whole Foods. I think your list is very reasonable and thorough. Great post! very good ideas! i am in the same boat as you... things are tight!! but eating healthy is one of my main priorities, especially since i am pregnant. :) thanks for sharing! Great advice! I would rather buy in season/non organic produce and allow my kids to have as much as they want than have to limit what they can eat because organic is so expensive. As long as they are eating fruits and veggies instead of junk food I'm happy(and so are they). My 2 year old eats 3-5 pieces of fruit a day. If it were organic we wouldn't be able to afford any fresh fruits for the rest of us! Have you checked Wegmans (if you have one in the area) for edamame? They have the shelled ones, or mukimame, and their current price is $1.99 for a 12 oz. bag (being an hour south of their corporate headquarters). Looks like the Leesburg store is at the same price, according to what I found on their site. You don't have to eat them exclusively, but they're great for throwing in a partial serving or such into your stir fry or other vegetables.